Last Updated: June 18, 2013 | Subscribe to our weekly newsletter! If you’re looking to quickly landscape around an inground pool on a budget, you have come to the right place. Here is a step-by-step guide filled with useful tips that will help you start and finish your inground pool landscaping project in 2 days or less. The goals for landscaping are going to be different for everyone. I have yet to work with a pool owner who didn’t want an attractive, low-maintenance planting design that offers privacy and didn’t drop debris in the pool. Get out a blank sheet of paper (or graph paper If you click this link and make a purchase, we earn a commission at no additional cost to you. ) and draw — to the best of your ability — the outline of your pool and the concrete or stone around it. Also, make sure to draw the perimeter of your yard. 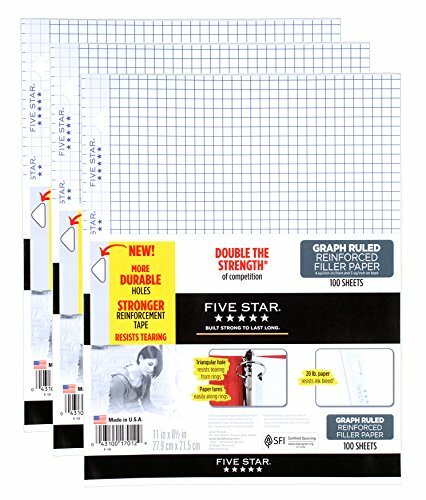 I recommend using a ruler or graph paper to get the best results. And use a pencil because I guarantee you will be making a lot of changes to your design. If there is anything that’s already included in your current landscape that you’d like to use, be sure to add it in your drawing. Remember that landscaping isn’t just about grass and plants. Incorporate some lighting elements If you click this link and make a purchase, we earn a commission at no additional cost to you. in your design as well. For more information about designing, I recommend you check out this article: Do it Yourself Pool Landscape Design. Use more stone, including using brick as edging to break up the flow from your concrete decking. Keep it spacious. Don’t crowd your pool area with plants and lights. Remember, the focal point is the pool. Use potted plants close to the pool and keep bedding ( mulch If you click this link and make a purchase, we earn a commission at no additional cost to you. ) farther away. For the best and cheapest soil, you want to mix new topsoil with your existing soil. 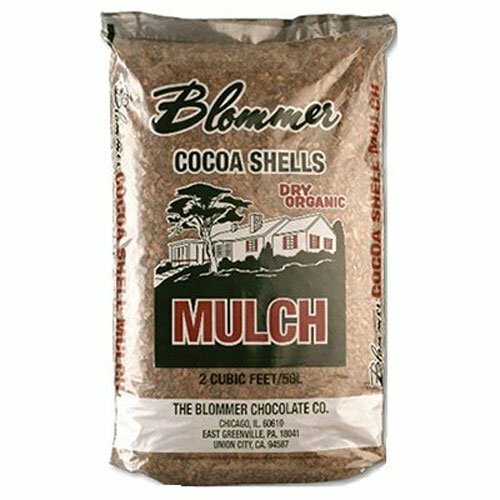 Look for organic mulch If you click this link and make a purchase, we earn a commission at no additional cost to you. made of shredded bark, pine needles, or a local product. Avoid alternatives like tumbled glass or recycled tires — they won’t break down and add nutrients to the soil. I tend to avoid anything with a lot of thorns (barberry, pyracantha, hawthorne) or sharp/spiky foliage (hollies, junipers). Certain trees, like magnolias, can be very messy and will drop leaves and litter all season long, making it more difficult to keep water clean. I also keep my summer-flowering plants a little farther away from the pool to discourage bees from bothering the swimmers. I recommend you check out this article from PoolProducts.com, where they talk about choosing the right plants for the area you live in. As with any landscape project, it’s only as complicated as you want to make it. A wheelbarrow, a pick, a shovel, and a steel rake will serve you well for most home landscape projects. And a broom or blower for cleanup, too. To save money, borrow tools from your neighbors and friends before going out and purchasing your own. Just don’t forget to return them. Hedge shears If you click this link and make a purchase, we earn a commission at no additional cost to you. Weeding hoe If you click this link and make a purchase, we earn a commission at no additional cost to you. Gardening gloves If you click this link and make a purchase, we earn a commission at no additional cost to you. 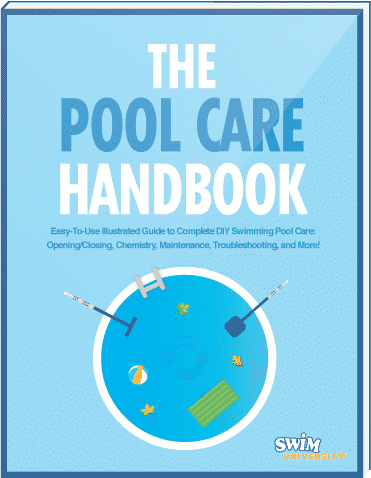 Start by cleaning the area around your pool. Check for any rocks in the soil and remove them. Remove all plant pots, debris, trash, metal and your garden hose If you click this link and make a purchase, we earn a commission at no additional cost to you. . Make sure you area is clean and ready to be worked in. Soak the ground the night before so it will make it easy to remove any weeds. The weeds will come up with soft ground. Use the tip of your garden hoe If you click this link and make a purchase, we earn a commission at no additional cost to you. to remove any weeds in your soil. As you tackle the weed, you want to pull out the entire root system. Be sure to remove all the weeds from your area before adding new plants. Remove any additional root systems you find in the soil. If you bought new plants, remove them from their pots, massage the root system to loosen them up and soak them in a bucket If you click this link and make a purchase, we earn a commission at no additional cost to you. with water for about 30 minutes without submerging the entire plant — just the base. Take this time to also remove any dead leaves off the plants. 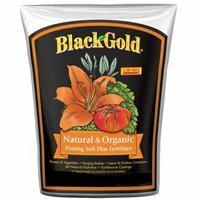 It’s time to start planting! Keep plants spaced out to allow for the root system to spread. Don’t plant to close to any walls or near your pool because this can affect the pH of the soil. Add clay pots in various sizes around the pool. Mix together existing soil and good topsoil. When you dig the hole for the plant, dig the hole deep enough for the plant plus an extra inch deeper and around the plant to allow the root system to take off. 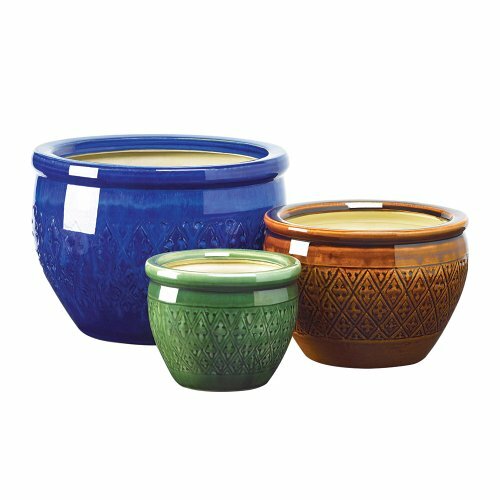 Use plants in colorful planters If you click this link and make a purchase, we earn a commission at no additional cost to you. close to the pool. Water potted plants more frequently then the rest of your plants. They tend to dry out faster in the pots. For a bigger area, put multiple potted plants together. Use potted plants as a means of transition. For example, place them at the end of a bench wall, on both sides of a door or gate, or beside pool patio furniture to help bring the pool layout together. You can find out more information about using potted plants and landscaping around your pool from this article: Inground Pool Landscaping 101. If you are using solar lights If you click this link and make a purchase, we earn a commission at no additional cost to you. around your pool, make sure they get direct sunlight. Before adding the light to the soil, loosen it up with a small shovel and gently insert the light into the soft soil. Most solar lights have plastic stems so you don’t want them to break when adding them. If you use tiki torches If you click this link and make a purchase, we earn a commission at no additional cost to you. (which are very inexpensive), don’t fill up the torches all the way with fluid, just add enough to soak the bottom of the wick. Keep an eye on your fluid levels before you light them to make sure you have enough fluid for the night. Got a Hot Tub Too? If you’re looking to do some more landscaping around your hot tub, we got you covered too! You can also check out some great short videos by Jose Zuniga of Expert Village here. Also, feel free to ask any questions in the comments below or on our Facebook page. You can view our entire infographic about landscaping your inground pool, which is based off this article: View the infographic. Repair cracks in your concrete pool deck before they become bigger, more expensive problems. Or resurface your whole pool deck for a new look and feel.